While in the last two years, the Pantone chosen colors were all about serenity and relaxation, this year, Ultra Violet is given the coveted title of Color of the Year. This time, the Pantone chromatic choice seems to suggest that modern tastes are happy to embrace the daring nature of unconventional spirits, a trait captured in these deep tones of purple. Pantone describes the color in terms that go from mysterious and contemplative to full of emotion and mystical – and this collection of adjectives is very fitting. The symbolic meaning given to purple along human history is impressive. The color of royalty and the symbol of wealth, purple is also a symbol of creativity (artistic brilliance, as Pantone puts it), and a color invested with magic power. Purple is indeed a contemplative color. However, the contemplation it invites is not the daydreaming kind, easy and unchallenging, but the one that takes the mind into the dark mysteries of nature and the universe, and the secrets of the human spirit. It is a suitable choice for a modern world where the deep interest in the seen and unseen world is only matched by the even deeper interest in what makes us human beings. In terms of decor, violet talks of opulence and elegance, but also of a nature that takes risks. So how can you use Ultra Violet in your designs? Here are a few ideas. While a talented designer might be able to use purple as the main color in an interior space without overwhelming the eye, deep violet is often used as an accent color or to make a statement with one or a few large pieces that demand and get the attention. However, if you have the courage, you can go bold by keeping your purple statement pieces, but also paint your walls the same color. In fact, you may discover that purple is surprisingly accommodating. Paired with vibrant colors, it creates a dynamic effect, very pleasing to the eye. 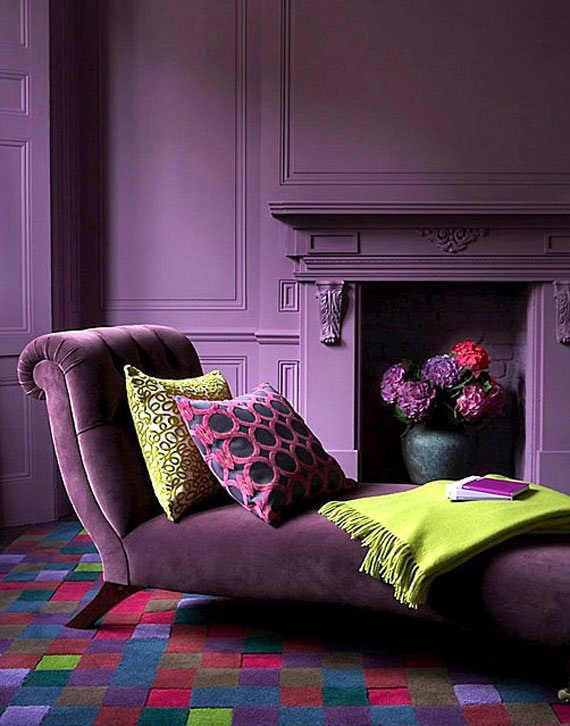 Most of all, purple suggests luxury, so combined with richly textured fabrics, it makes a striking visual impact. Purple is definitely not the shy one’s choice. A purple-centered decor suggests courage of expression and a creative spirit. Of course, the easiest and safest way to use violet tones in your decor is to concentrate them around a few accent pieces. Purple has an excellent ability to infuse even the simplest, most neutral spaces or chromatic palettes with energy. With violet tones, the eye never starves color. An accent wall is always a simple way to adopt new trends or quickly change the mood of a space. However, if you are not ready for a purple wall accent, you can make violet tones share the space with other colors, like in this example of dramatic intersecting lines. If you have already incorporated green into your decor following the trends from last year, here is your chance to update it with purple without much effort. The design below has the additional quality of bringing in not only vibrant colors, but also daring patterns. Violet tones are not only for living rooms and bedrooms, but can also turn on the fun in unexpected places. 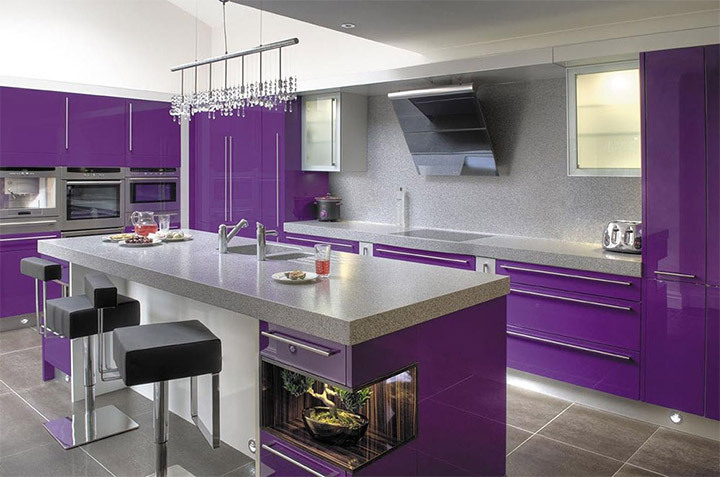 If you are undecided when it comes to the color of your kitchen cabinets, try purple. Offset by a neutral background, the strong violet hues are toned down, yet they turn the kitchen into a stimulating and engaging place. Finally, changing your bathroom into a daily retreat with a royal feel may be as simple as a fresh coat of purple paint. Purple tile may give you an unequaled visual impact, but it is indeed for brave spirits. However, a combination of gold accents and purple paint may transform your bathroom into your favorite interior space.